I am intranced by this out of control Flash comic called NAWLZ. It takes place in some super-future where astro-projection is possible through the use of mind-altering technology available at the consumer level. WHAT. What I meant is you can buy acid at Best Buy. Pretty out of control art and ideas, definitely worth checking out an issue or two. Each issue features it’s own music, animation, and sound design. Very, very cool stuff. We did it. MCDeathBear and I completed this little ditty in about two weeks. It’s all your childhood fantasies in the way you always wanted them. That’s right, The Ultimate Warrior from from WWF battling Star Wars Stormtroopers. You’re a nerd right? You get this kind of stuff. I should warn you, it does include some Gratuitous Violence. MC Death Bear and Chris “DJ Name” Davidson working on The Ultimate Warrior VS Stormtroopers. Woo fun late night animation session. We’ve submitted the Olympus Burger pilot to Adult Swim! Today, we mailed the Olympus Burger pilot episode and bible to the late-night Cartoon Network block, Adult Swim! Getting onto Adult Swim has been our goal for Olympus Burger since the beginning (which was almost four years ago) so we’re keeping our fingers and everything else crossed. This picture was taken six minutes before the post office closed, but Chris* turned into The Flash and got it there just in time. He was locked in the post office for a couple minutes afterwards, but then he turned into the Hulk and…asked the lady at the desk to let him out. Unless the mail gnomes get at it, the package will arrive in Adult Swim’s submission box tomorrow. We’ll put up another post when we hear from them, so check back soon! *Even though that little sign says “Connor,” that’s Chris. Trust me. 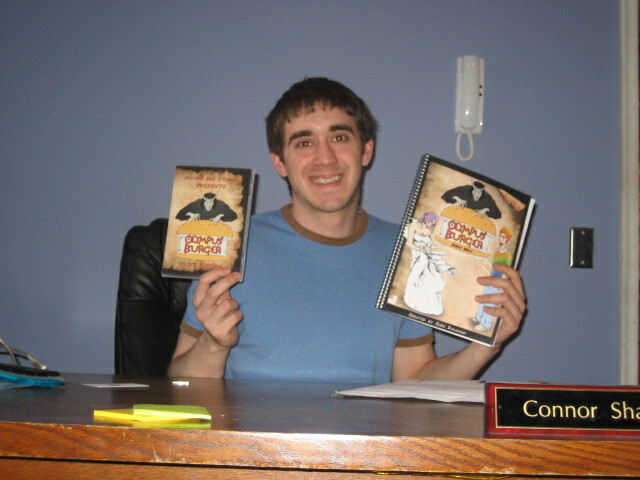 This is Steve, a current all-purpose animation intern at Moving Box Studios. My creative director Chris Davidson wants to give you all some insight into what us interns actually do (i.e. not watch cartoons all day), so here’s some insider info. I had my hands on the pilot episode of Java, correcting colors and whatnot. Java refused to “pop” against the background in his drab duds. We can’t have our title character blending into the background, so I created a bunch of alternative palettes. I consulted with Chris on what the final color choice should be, and after picking it, I went to town in Adobe Flash changing each instance of Java to the new palette by Cmd + I’ing and Cmd + K’ing everything into submission. Repetitive? Eh, maybe, but it seriously helps develop an eye for color, attention to detail, and, well, using Flash in general. Java will be coming to your screen this summer… so I better hop to it.